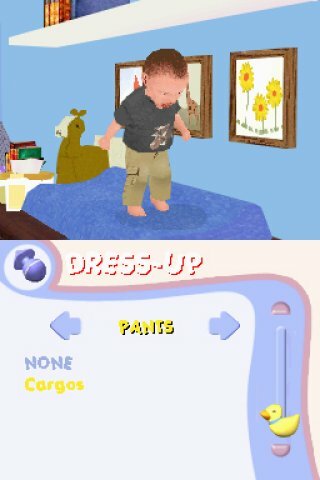 We've seen all sorts of sim games and "Baby Pals" from THQ is probably one of the most unusual and strangely rewarding games to have graced the Nintendo DS in quite some time. With that said, the game is aimed at both girls and women (one would presume) who thanks to some clever programming can look after their virtual babies in Baby Pals. That's right, you can feed your baby, dress your baby, play with your baby and perform a variety of other mother like aspects in Baby Pals. Before you start, you must adopt your baby (YAY) and of course organise the way your little new born looks by tweaking a variety of their features. 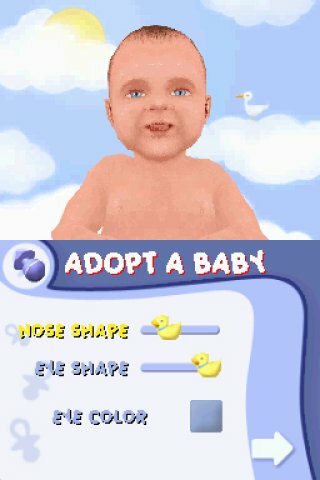 Once you have created your virtual baby, you must start to look after your baby where you can play a variety of real-world games with he or she. My favourite aspect of the title is using the stylus as a spoon while feeding the baby, it's super cute... no... it's uber cute! These mini-games have you playing with your baby, teaching your baby and just making sure they have all their needs met. It's like the Sims but for babies... and a lot more simplistic. As you progress through the game, you are awarded various items that can then be given to your baby because as we all know, babies love new things. There are also some consequences if you do not look after your baby but how could you, they are once again... yes... uber cute! 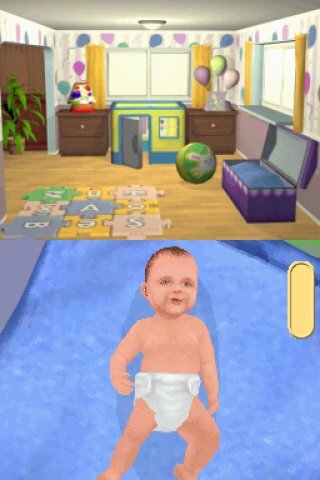 Graphically, Baby Pals is quite impressive on the Nintendo DS, even though some of the babies are a little creepy looking from their realistic movements, however the majority of babies are what you would aspect to see in real life. The animation of the babies are also quite realistic and the move with this almost otherworldly grace and you look after these little virtual creatures. To compliment the graphics, what other sorts of sound effects would you expect to hear than little babies crying, laughing and in general acting like real-life babies. Needless to say, you need quite a lot of patience to play Baby Pals. 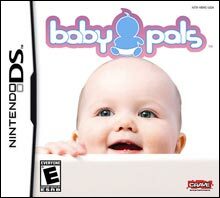 In conclusion, Baby Pals is an interesting premise that will appeal to a wide variety of female gamers and maybe a few males who have their partners pushing them for babies. The title is gender biased, however for those gamers who wish to experience the joys and downs of caring for little babies, than this is the game for you. Good graphics, realistic sound effects and interesting mini-games, Baby Pals may be the sleeper hit of 2008 for the female gamer!